We've seen this one in blurry shots back in January, sporting a Sony Ericsson logo. Today, the Sony MT27i Pepper emerged in a press shot, proudly wearing a Sony logo, with Xperia Smart Tags by its side. As you have probably guessed already, the Smart Tags clearly suggest that the device will sport NFC connectivity when launched. The rest of the rumored specs include a 1GHz dual-core CPU and NovaThor U8500 chipset, 3.7" screen with resolution of 480x854 pixels, and 5MP snapper. I got this phone a month ago, it was a fast phone and fit for myself i just unlocked its bootloader and root it. then booom a super phone. Buy this thing, its an amazing phone. 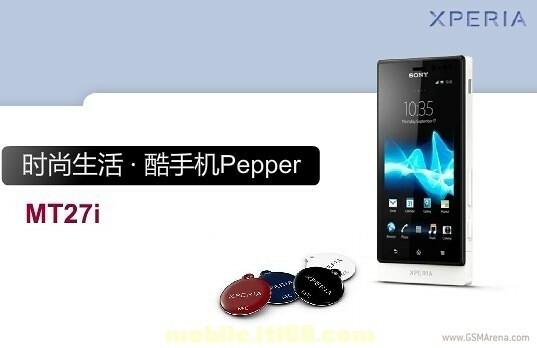 Xperia pepper = sola?? Checkout sony indonesian website..